Suggested Maximum Parameter Levels in Water Used for Crop Irrigation"
a Based on data from "Water Quality for Agriculture," FAO Irrigation and Drainage Paper No. 29, Rev. 1, Food and Agriculture Organization of the United Nations, 1986, and Colorado water quality standards for agricultural uses. b Depends on salinity. At given SAR, infiltration rate increases as water salinity increases. c Depends on sensitivity of crop. d Suggested maximum value is for a water application rate consistent with good agricultural practice (about 10,000 m3/year). Toxicity and suggested maximum value depend strongly on the crop. Trace elements normally are not monitored unless a problem is expected. Several trace elements are essential nutrients in low concentrations. Equation 6.8 is theoretically complete at a molar ratio of 3 to 2 and a weight ratio of 7.6 to 1 of Cl2 to NH3-N. This process is called breakpoint chlorination. The reaction is very fast and both ionized (NH4+) and unionized (NH3) forms of ammonia are removed. Water Parameter Levels of Potential Concern for Crop Irrigation"
b With surface irrigation, sodium and chloride ions are absorbed with water through plant roots. They move with the transpiration stream and accumulate in the leaves where leaf burn and drying may result. Most tree crops and woody plants are sensitive to sodium and chloride toxicity. Most annual plants are not sensitive. c With sprinkler irrigation, toxic sodium and chloride ions can be absorbed directly into the plant through leaves wetted by the sprinkler water. Direct leaf absorption speeds the rate of accumulation of toxic ions. d SAR values greater than 3.0 may reduce soil permeability and restrict the availability of water to plant roots. e NO3 levels greater than 5 mg/L may cause excessive growth, weakening grain stalks and affecting production of sensitive crops (e.g., sugar beets, grapes, apricots, citrus, avocados, etc.). Grazing animals may be harmed by pasturing where NO3 levels are high. 1. The rate of ammonia removal is most rapid at pH = 8.3. 2. The rate decreases at higher and lower pH. Since the reactions lower the pH, additional alkalinity as lime might be needed if [NH3] > 15 mg/L. 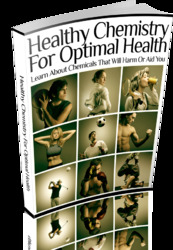 Add alkalinity as CaCO3 in a weight ratio of about 11 to 1 of CaCO3 to NH3-N.
3. Rate also decreases at temperatures below 30°C. 4. The chlorine "breakpoint," (see Figure 6.2) occurs theoretically at a Cl2:NH3-N weight ratio of 7.6. 5. In actual practice, ratios of 10:1 to 15:1 may be needed if oxidizable substances other than NH3 are present (such as Fe2+, Mn2+, S2-, and organics). 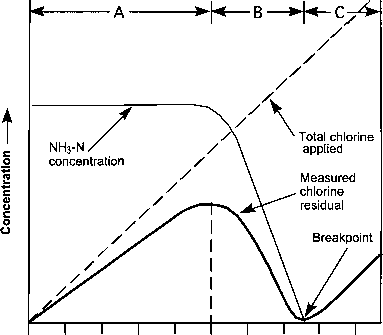 FIGURE 6.2 Breakpoint chlorination curves showing removal of ammonia from wastewater. Region A: Easily oxidizable substances such as Fe2+, H2S, and organic matter react. Ammonia reacts to form chloramines. Organics react to form chloro-organic compounds. Region B: Adding more chlorine oxidizes chloramines to N2O and N2. At the breakpoint, virtually all chloramines and a large part of chloro-organics have been oxidized. Region C: Further addition of chlorine results in a free residual of HOCl and OCl-. A waste treatment plant handles 1,500,000 L/day of sewage that contains an average of 50 mg/L of NH3-N. How many grams of Cl2(aq) must be present daily in the wastewater to remove all of the ammonia? Answer: By equation 6.8, 3 moles of chlorine are needed for every 2 moles of ammonia nitrogen. 1,500,000 L x 41.2 mg/L = 61,800,000 mg N, or 61,800 g N/day. Depending on the quantity of other oxidizable substances in the wastewater, the plant operator should be prepared to use up to twice this amount of chlorine. How does breakpoint chlorination remove ammonianitrogen from wastewater? Is breakpoint chlorination used for wastewater disinfection? Why removal of ammonia from water by breakpoint chlorine is decreasing? 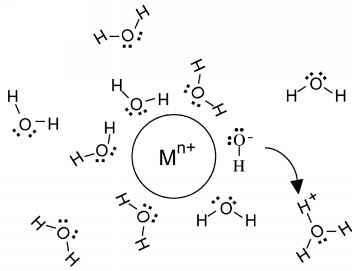 Does cl2 remove ammonia from water? Does breakpoint chlorination remove ammonia? How does ammonia impact chlorination at wastewater treatment plant? How does breakpoint chlorination remove nitrogen?